I'm back with the finished card from the Speed Craft Challenge #2 - Colour Theme. TIME TO COMPLETE MY CARD - 7 hrs. I had to let all the layers of glitter, snow and crackle accents dry before I could assemble the card. I think my colours are a little towards the blue side, but it's what I had for aquas and I think it worked OK. I find Christmas cards to be the hardest to photograph. All the shimmers and glitters and metallics and shine...they do not not speak on camera the way they do in real life. I hope you can see all that glitters and shines on this card, just like a fresh snow under the twinkly lights. - for the background, I applied some home-made texture paste through a Tim Holtz's Bubble stencil. While the paste was still wet, I covered it with white embossing powder and heat dried it. The embossing acts as a resist for the painting stage, so the raised areas stay white. - I mixed up four different colours of diluted aqua paints and used a small sip straw to drip the paints down the page horizontally and vertically. 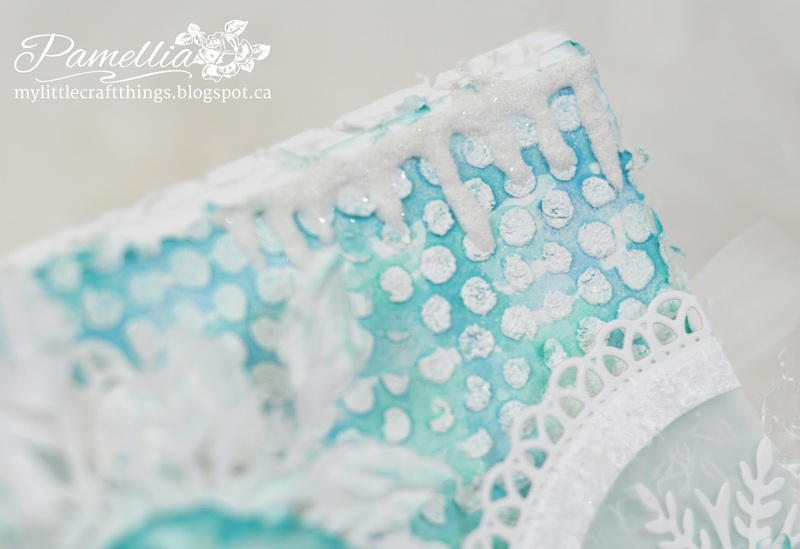 - the icicles are made from Snow Tex and covered with Rock Candy Distress Stickles - Dry Glitter. I love this stuff!! - the flower is made using Spellbinders foliage die and coloured with Tim Holtz distress ink Peacock Feathers. I filled the inside of the flower with chunky crystal glitter...so shimmery! - the frames are cut out using Spellbinders Grand Stately Circles. I lined them with vellum, covered them with clear chunky glitter, popped them up on foam dots and stuffed frilly silk mesh underneath. - the snowflakes are from the Penny Black Snowflake Trio set. 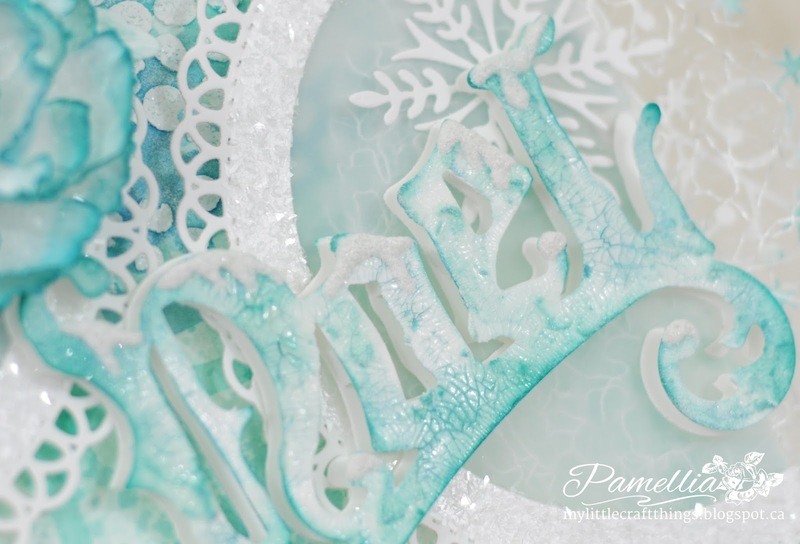 - I cut the Noel from Tim Holtz Vintage Noel set and partially covered it with texture paste. I didn't want it to be completely flat, so that gave it some depth and texture. I painted it white, the used Peacock Feathers distress ink to highlight the raised area, giving it a marble appearance. - I covered it with DecoArt Crackle Medium and then rubbed Peacock Feathers and Tumbled Glass into the cracks for a little extra texture. I added some Snow Tex and Rock Candy dry glitter to the tops of the letters. Oh! Looks like I saw it first! This is outstanding...absolutely stunning. The colors are cool and the textured too! You are too good at making cards. This is a real visual treat. Oh Pamellia,this is lush beyond words....again! It's a real jaw dropper,I absolutely adore the colour used and it has a real winter wonderland vibe to it. There is no way I would send this to anyone...would never part with it! Everything you create just gets more and more wonderful,you are a star. Oh my crafty Goodness! This is spectacular! This is like a winter wonderland type of card!!! I just want to bury myself in the prettiness!! Oh, it was worth waiting for! Gorgeous! Very lovely, very different but beautiful. Beautiful work, so pretty, love the colour, absolutely gorgeous, love it! WOW! 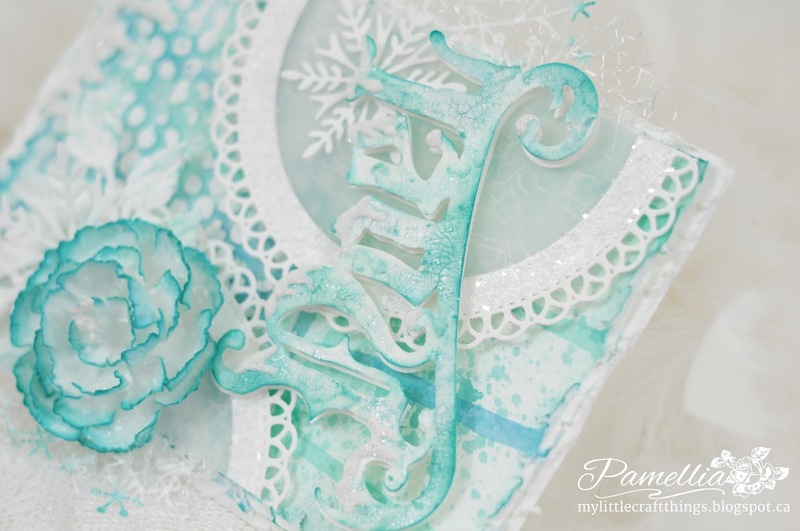 The beauty of your card is breath-taking Pamellia, honestly this is one of the most stunning Christmas creations I have ever seen. 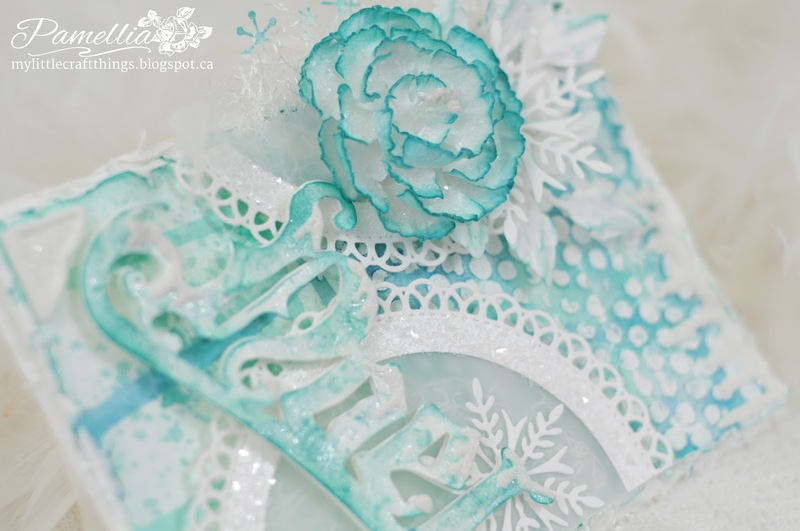 I LOVE the icy blues, wonderful textures, beautiful detailing and all the sparkle looks magical. Totally inspiring. Gorgeous card, awesome details as always. This is absolutely stunning Pamellia, I love the gorgeous colour and I certainly can see all of the sparkle and shimmer. There are so many fabulous details and wonderful textures. OMG!!! What a gorgeous card!! Love all the details! soooo beautiful! So just gorgeous is your card , i can understand why it took you 7 hours such a lot of work has gone into it such beautiful detail and textures but hey soooo worth it . I love it all . Well the finished result is stunning as always ... You can't rush an artist! Blogger not letting me comment on your 10 minute wonder grrr! This is stunning. Never thought of Peacock Feathers being a Christmassy colour but it looks fab, like an ice sculpture! 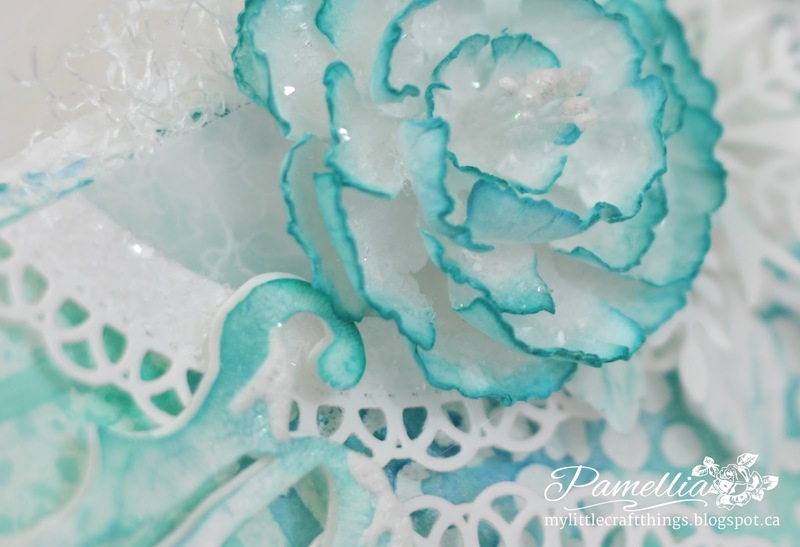 Pamellia, LOVE the aqua and the glitter and the crackle! Gorgeous card! Wow, wow, wow, is this ever a beauty! I love the color and all the details. You have done a fabulous job. I am a new follower, I hope you will follow me back. stunning card. So pleased you've joined us at Southern Girls Challenge. Wow, I love the finished project! 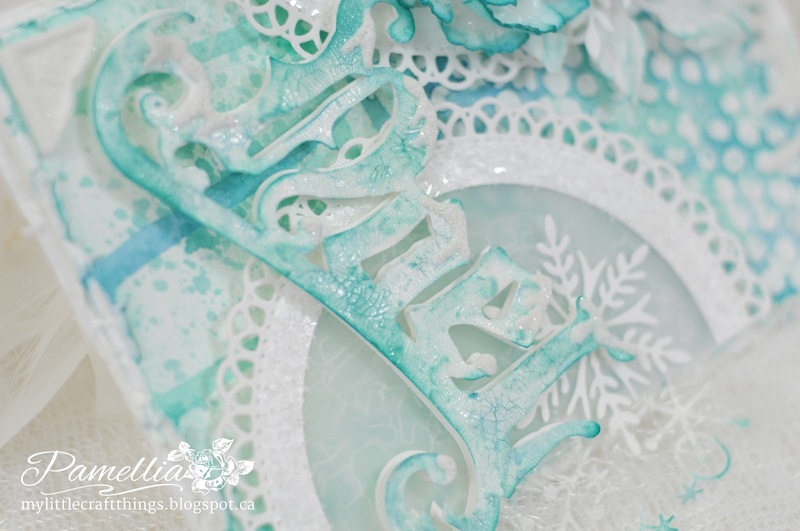 Such a stunning Christmas creation, I love those frosty colours and the icicles look amazing! Super card, great christmas design! Glad you joined us for the challenge at Southern Girls hope to see you come back soon!